Phoenix, Arizona - About a dozen people carried guns outside the Phoenix Convention Center while President Barack Obama was speaking to veterans, police said. Phoenix Police Detective J. Oliver, one of three officers assigned to monitor a man carrying a semi-automatic weapon, told The Arizona Republic the man was not breaking any laws. The man, who also carried a pistol and identified himself only as Chris, debated Obama’s healthcare policy with others in the crowd while the president addressed the Veterans of Foreign Wars national conference. Arizona law allows people to carry weapons openly but a permit is required to carry a concealed weapon. Protesters have carried guns in recent days at town hall meetings, including one the president attended last week in New Hampshire. Republicans no doubt. They are being egged on by their leaders on talkradio. Sounds like the secret service is trying to "brace us" for the worst so that if anything happens we will not blame them when they claim "nothing we can do" nebech they are so "helpless" (when they want to be). Whenever government wants to arrest anyone they lack no excuses to find to be able to do whatever they want. But when they would rather "blink", they claim to be helpless "nebech". The president can also carry his gun if he likes to, matter of fact i think police or secret service are also intimidating. Tobad Mr. President that is the constitution and its for a good reson. It make sense to be aloud to carry a gun, wht if the goverment decides to do to people lke they did to jews by second world war. Imagine the jews would have guns on themselves it wouldnt happen! Read this paragraph again: "Arizona law allows people to carry weapons openly but a permit is required to carry a concealed weapon." In other words: Nothing happened. We yidden are not a nation that rules bt sword. There is no reason why we should associate with the people walking with guns. Sometimes we forget who we are and what we stand for. I don't like Obama either and I think that it was a BIG mistake to vote him in, however we don't need to accept or tolerate violent or aggrasive behavior. It needs to be condemmed. Sam - but is it a good idea to allow weapons everwhere ? Would you like someone you don't know coming into shule or school with a gun ? Whats the big deal? We have a constitutional right to bear arms. First off, the secret service are meant to be intimidating to prevent ppl from harming the president. 2nd, the Jews in warsaw HAD guns, and we all know the outcome. Poster number 4 remarks on how Jews might have been able to defend themselves had they had guns in Europe in the 1930s and 1940s. How many Jews today have guns and are trained in their use? In some communities, some Jews do own guns legally, but I doubt that in most Jewish homes there are guns nor anyone who knows how to use one. Hence, we must rely on the police to defend us. Whether this will prove a wise strategy eg during a disaster is arguable. On the other hand, most kids shot in a home are shot accidentally by a gun of a parent. Overall, those trained and responsible in the use of guns could be of benefit to our communities. This is just a story put out by the Obama administration, in order to make people who disagree with Obama's policy as radicals. The same reason why the protests at town hall meetings, were labled as "mobs". During the Bush administration, there were thousands of left-wing protests concerning the military operations in Iraq. Not once were any of these left-wing people who were exercising their right to free speech, labled as a radical mob. Yep, it's all over talk radio to bring your gun /not. The guy in the picture with the assault weapon was from the Democrat side according to what I've heard. Additionally, let's not let those who have legal guns bring them to public gatherings. We should only allow criminals to come with their hidden weapons so that they have a clear field to commit their mass murder. I can't believe people here aren't horrified by this! All it takes is one nutcase to lose control. Do people here REALLY not care if the president was assassinated or for others to be hurt in an attempt? This is NOT what Yiddishkeit is about! 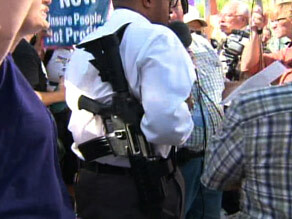 There is NO excuse for guns or other firearms at a political rally. You want to protest? Fine, protest, but with words only! And I can't believe that you do not understand that self defense is a basic right of Jews, described in the Talmud, discussed in the Torat Moshe, and incorporated in the US Constitution. Yiddishkeit? The only reason we did not defend ourselves for 2000 years in the West was that we were forbidden to do so by the authorities. Do you actually question the Yiddishkeit of Bar Kochva? Matityahu Chashmonai? Those who built the Be'it Sheni? They held a building tool in one hand and a weapon in the other. Check out Ezra and Nechemya. It is happening again in EY. If not for armed civilians and reservists, recent terrorists would have done much more damage. Have you read recently of any home in EY where guns went off accidentally? If people care about their children and watch what they are doing this happens much much less frequently. maybe not, but this is a normal way of life for many people in the country in which we live. should we not then do everything we can to protect ourselves? perhaps in this day and age, part of our hishtadlus IS to learn how to use a gun. what exactly is wrong with carrying a gun? And don't forget, out in that desert there are snakes and coyotes, some even walk on two legs. (wink) A man needs his protection in plain view and easy reach. PHoenix is one of the worse cities in the US for crime. The whole idea behind the Second Amendment is so that you will continue to be a nation not ruled by the sword. Unless the leaders have a healthy respect, even fear of the populace, you will find yourselves being a populace in fear of it's leaders. Yakov went to war with tefilah and ammunition. Well prepared. What are you talking about? We don't kill people we don't agree with, but we are NOT "a nation who does not rule bt sword"! and to PMO-Maybe we SHOULD all go out and kill the liberals who want to bankrupt this country and turn it into a communist country. Seems to me the only way their plans will be killed, for good. But do you even listen to the conservative talk show hosts? Because I do, and I've never heard any of them mention using violence to make their point and voice their opposition. nice jewish boys like you dovid should not be playing with guns. you always have the police and government there to protect you. the us secret sevice is aware and on top of these matters..
On private property the owners can create any policy they wish. Remember, the bad guys will have the guns no matter what. Restrictive gun laws keep guns out of the hands of the good guys. I responded last night, but it did not get posted for some reason. I did not write comment #2. I fully support an individual's right to lawfully carry an exposed firearm in public or concealed firearm with proper permitting in public. This is is not a Repub vs. Dem vs. Libertarian issue. It is a Constitutional issue.